NEW YORK / CHICAGO — I saw Okwui Okpokwasili’s piece Poor People’s TV Room when it premiered at New York Lives Arts last spring and was struck by its richly layered and complex rendering of the lives of four black women. Weaving dance, song, text, video, and stage design, this work draws from African and American contexts to consider the legacies of collective resistance led by women that all too often obscured by popular media. As the cast travels to perform at the Museum of Contemporary Art Chicago next week I spoke with Okpokwasili about the process of developing this work and how it has continued to change during touring. Katy Dammers: What was the development process of the work like? I know you went through a number of residencies. Okwui Okpokwasili: We were really lucky to have all of those residencies that provided space for us. For example, when Peter Born, director and designer, and I set up the plastic it told us a lot about the mediation between presence and memory; it was this porous space between the living and the dead. Exploring that could not have happened if we didn’t have residency space so we could build things, and tear them down. KD: When in the process did you start working with the three other performers: Thuli Dumakude, Katrina Reid, and Nehemoyia Young? OO: None of them were people I had worked with before. Another great thing about having the multiple residencies and the Randjelovic/Stryker Resident Commissioned Artist Award at New York Live Arts in particular was that I could hold workshops where I asked people to work with us throughout the process. It took us about a year and a half to get the cast together. There was a part of me that always wanted to work with a lot of women, but it was would have been hard to support a project with nine people. 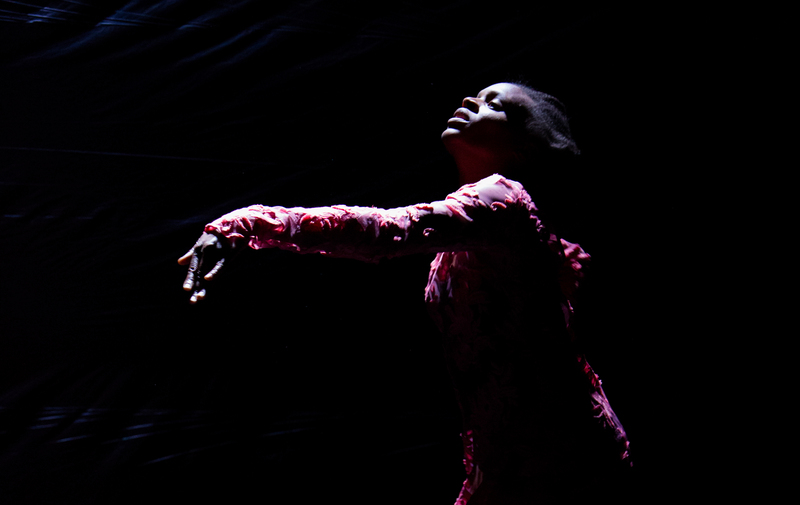 Okwui Okpokwasili in “Poor People’s TV Room” | photo credit: Mena Burnette of xbmphotography. KD: What moved you to create Poor People’s TV Room in relationship with material including The Women’s War of 1929 in Nigeria and the kidnappings by Boko Haram? OO: Both Bronx Gothic and Poor People’s TV Room are of a piece with my concerns around the visibility of black and brown women, and what I hope is the opportunity to make a platform for a complex rendering of brown and blackness. When I started working on Poor People’s TV Room in 2014 we were dealing with the Boko Haram kidnappings in Nigeria, the aftermath of Michael Brown, and we were getting ready to hear verdicts on the folks who killed Eric Garner and Trayvon Martin. With Black Lives Matter we were seeing the incredible activism of black women as they rallied support to look at the violence being done against black and brown bodies by the police. The Boko Haram killings and the meme that took off around #bringbackourgirls brought a visibility to a distinctly Nigerian experience. It forced the Nigerian government to contend with the fact that these girls were missing and that they had to do something about it. The meme started with the collective agency of women in Nigeria who are coming to their own defense and acting with a sense of urgency and agency that sometimes gets elided when we look at media representations of Africans. KD: It was interesting to me to learn about the Women’s War of 1929 in Nigeria and to see that so much of the collective action was around dance. OO: Indigenous people talk about the Women’s War as the Women’s Egwu—in Igbo [a language native to southeast Nigeria] egwu means dance. Linguistically dance and performance are connected to this idea of protest. Embodied protest as performing an attempt to be visible is really incredible to me. In my research I discovered that Nigerian women had traditions of collectivity. If there were problems in their village or if they had to intercede on behalf of women, they came together collectively and had strategies to draw attention to their concerns. They were working in markets and building informal organizations that supported their life in public to make sure they were not subject to the whims of folks in power. Even though in Igbo society there were a number of ways that men still had power over women, women made spaces for their voices to be heard. KD: In what ways do you present the TV room in this piece as a space of resistance? OO: I feel like the TV room is a space for people to reflect on how they are watching. It also a shout out to Nollywood [a nickname for the Nigerian film industry] and the resourcefulness of folks who are tired of consuming bootleg versions of Western popular culture — who instead say to each other, actually, we have stories to tell each other, stories we can make. Nollywood is the third largest film industry in the world. It’s a space of Nigerian mythmaking for the Nigerian people. KD: I was struck by the phrase “collective amnesia” that you use to describe Poor People’s TV Room. So often in the last couple months there has been collective amnesia around Black Lives Matter, #metoo, and gun control—in what ways does TV perpetuate a cycle instead of inspiring enduring change? OO: When you said that, I was thinking of John Bolton, he’s about to become national security advisor and he was one of the architects of the Iraq War, and he is now using the same language he used in the Iraq War to talk about North Korea and Iran. TV focuses on generating and projecting content as a platform for ad revenue; it ultimately doesn’t have the ability to support the collective memory. It’s about selling things and producing consumers. KD: How has the work changed in the past year that you’ve been on tour? OO: It has changed in many ways. The women in it are gaining greater possession of their parts, and it is really quite brilliant and wonderful to watch. Peter and I were always trying to create this charged energetic space and to send out signals that can make that happen for the performers. The signals are quite strong now and the performers are awake to the signals in the text, the movemen,t and how they operate together; it’s just becoming richer and richer. I don’t know how big these changes are, they could be very subtle, but they feel monumental. “Poor People’s TV Room” runs April 12-14 at 7:30 p.m., with an additional 2 pm show on April 15. This Sunday matinee is presented with ASL interpretation and audio description. Tickets are $30, available at 312-397-4010 or www.mcachicago.org. Purchasing a ticket for “Poor People’s TV Room” includes free admission to the April 22 screening of Bronx Gothic. Katy Dammers is the Assistant Curator and Archive Manager at The Kitchen. She also works as the General Manager for Rashaun Mitchell + Silas Riener and is part of the inaugural Dance Writing Laboratory at the National Center for Choreography in Akron, Ohio. 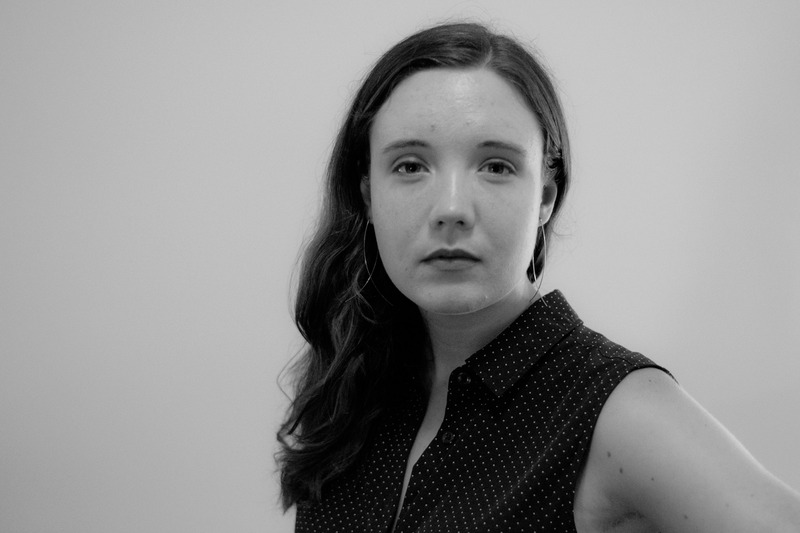 Her writing has appeared in the Movement Research Performance Journal, The Brooklyn Rail, Critical Correspondence, Culturebot, and The Performance Club.